Correct form of the name is Åsne Seierstad. The Sacramento Public Library Foundation will be raising much-needed funds for the Library’s Summer Reading program. Guests attend the event for the privilege of meeting accomplished authors and because they wish to make a financial contribution to help Sacramento children participate in the annual Summer Reading program. Each year the Foundation invites 40 California authors spread among several genres, including fiction, nonfiction, mystery, thriller, history, science fiction, and poetry, to name a few. The SAN FRANCISCO TRAVEL BOOK CLUB and LECTURE SERIES will discuss The Bookseller of Kabul by Asne Seierstad. Asne Seierstad reads from The Angel of Grozny. 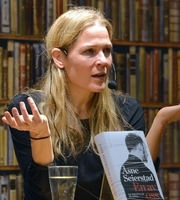 Born in Norway in 1970, writer Asne Seierstad has worked as a foreign correspondent in Russia, China, Kosovo and Iraq and has won numerous awards for her journalism. Her novel, The Bookseller of Kabul, was first published in Norway in 2002; it became a best-seller and over one million copies have since been sold worldwide. Seierstad's Library Late appearance on 5 March coincides with the publication in English of her latest book, The Angel of Grozny, which explores the human side of the conflict in Czechnya. Åsne Seierstad is currently considered a "single author." If one or more works are by a distinct, homonymous authors, go ahead and split the author. Åsne Seierstad is composed of 27 names. You can examine and separate out names.